They might not be the wardrobe staple you thought you needed, but women's leather pants will never let you down. 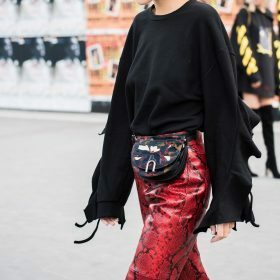 It instantly elevates your look from super casual to dressed up, even if the rest of your outfit is very basic (think: white long sleeved shirt, a black cardigan and a pair of sneakers). Go for black for your every day kind of trousers, but get a red pair for special occasions. Try silver, perhaps, or gold, for a pair you're sure no one else will be wearing.